Everyone knows that the burning rays of the sun can damage you skin. You probably also know that those same ultraviolet light can age the front of the eye, contribute to the formation of cataracts and even permanently damage your retina. 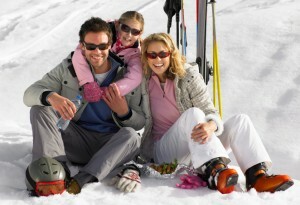 The whole family needs sun protection but sunglasses are particularly important for kids. The effects of exposure to visible and Ultra violet (UV) light are cumulative and cause sight threatening damage to the delicate structures of the lids and eyes. In children under ten, the skin of the lids is more delicate, and more easily damaged by ultraviolet light. The lens within the eye is virtually clear providing no protection for the retina from the burning rays of the sun. Kids and teens spend far more time outdoors. Just like sunburns that lead to skin cancer, the most damage from the burning rays of the sun occurs early in life. Experts report that 80% of the damage to your eyes from exposure to UV light occurs before the age of 18. It is estimated that if we could protect a child’s eyes from dangerous sunlight that we might eliminate Age Related Macular Degeneration (ARMD). ARMD is debilitating damage to the portion of the retina that is responsible for the central vision used for reading and recognizing faces. All of our sunglasses, with prescription or without, are made with ground and polished lenses. They are color matched, distortion free and they all contain an ultraviolet filter to protect your child’s eyes. The right lens color can heightened contrast, enhance visual comfort and improve your child’s vision. Polarized lenses can shield your child from the blinding glare of reflected light. Ultra violet light intensity more than doubles when reflected off water, snow or even a well groomed soccer field. Polarized lenses block this intense reflected light and reduce glare. Optimize your child’s vision and improve their performance in any outdoor activity with quality sunglasses, with a prescription or without. Improving your child’s vision with proper lens selection is part oof our mission at Parrelli Optical®. The facial features of a young people continue to develop into their early twenties. It is critical that a sunglass frame fit well as it straddles the bridge of the nose, hugs the side of the head and is secured behind the ears, so as to not damage or deform this delicate evolving tissue. All of our sunglass frames for young adults are ophthalmic quality mountings specially designed to fit young people. Each of our Licensed Dispensing Opticians is specially trained in adjusting these frames for optimal protection and comfort. You can trust that the professional Opticians at Parrelli Optical® have the expertise to fit sunwear to protect your child’s eyes, their sight and their anatomical development. “You Must Be Totally Satisfied” written guarantee.